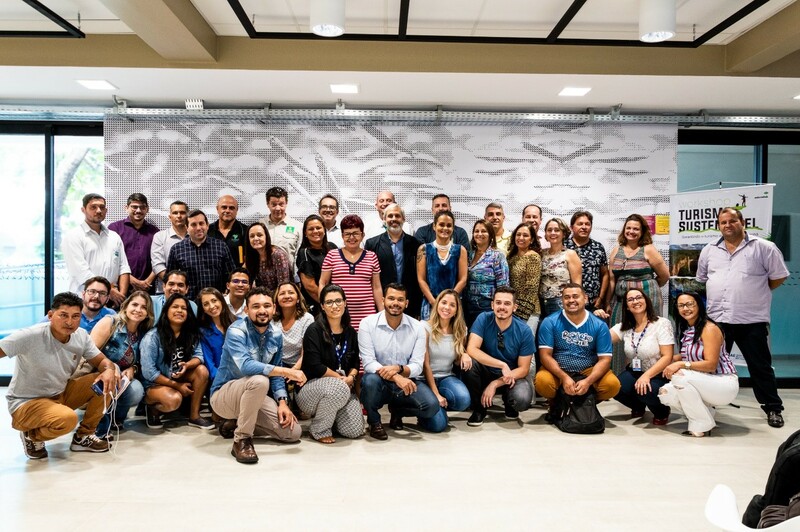 14 March 2019, Mato Grosso State, Brazil – PAGE partner organizations in Brazil, the State Secretariat of Tourism and SEBRAE, jointly conducted a Workshop on Sustainable Tourism for government managers and private and entrepreneurial Initiatives. The event brought together about 80 entrepreneurs and public managers to discuss crucial challenges and opportunities for the sector, above all, the development of guidelines for sustainable tourism in Mato Grosso. The State of Mato Grosso attracts many tourists every year, who enjoy the areas’ biodiversity and outdoor activities in a stunning landscape, such as in the Chapada dos Guimarāes National Park. The Northern Pantanal is the state’s most famous destination. With an area close to 200 000 km2, the Pantanal is one of the largest wetlands in the world, offering an amazing natural setting. The Pantanal contains a very high degree of biodiversity with hundreds of different species, which makes it famous for its remarkable wildlife attracting hundreds of tourists every year. The workshop analyzed the main challenges and opportunities for the sustainable tourism in Mato Grosso, looking at collaborative networks, the role of public power, potential for private investment and possible paths for the development of sustainable tourism in the state. "We are going to prepare guidelines, and for this, we are doing a series of surveys, identifying economic data, practices that already exist in other states, certification standards as references, to build an agenda for Mato Grosso" said Alexandre Garrido, environment and sustainability consultant. The event also gathered 34 entrepreneurs who work in several areas of the tourism sector. 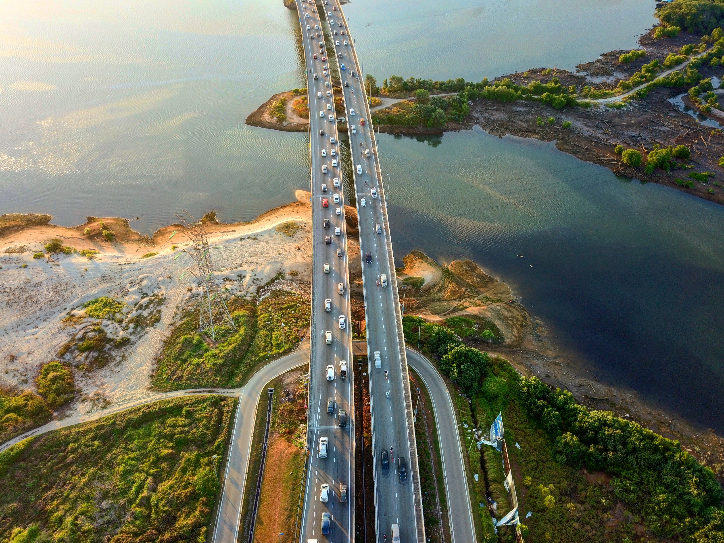 Lack of infrastructure, quality services and adequate skills are among the main obstacles pointed out by private sector representative when asked about the main challenges for tourism development in Mato Grosso. Participants also expressed the need to increase investments on sustainable tourism where the use of resources is environmentally responsible, socially just and economically viable. Mato Grosso was the first subnational state to join PAGE in April 2016, and is currently receiving support from the Partnership on the development of the sustainable tourism sector, among others. In collaboration with SEBRAE, PAGE has been supporting the elaboration of guidelines for the standardization and certification of Sustainable Tourism Products as well as on the elaboration and promotion of financial strategies for sustainable certification in key products. "We have developed a supportive work in search of international partnerships and investments, which can bring greater impact to the actions that are already happening," said Marcela Gaíva project assistant and PAGE representative. 9-13 March 2019, Georgetown, Guyana – The Guyana Green Economy Week featured a series of technical workshops, bringing together representatives from the Ministry of Finance, the Guyana Revenue Authority, Ministry of Business, private sector, the media, the national chamber of commerce, donors, representatives of civil society organizations and research institutes among others. PAGE was represented by delegations from UNITAR and UN Environment. The Green State Development Strategy: Vision 2040 will be launched in 2019 as the main policy tool ensuring that Guyana’s development pathway promotes economic diversification and growth, social inclusiveness, and sustainable management of natural resources. Through the strategy and its recommended policy instruments, such as the establishment of the Natural Resources Fund, the income generated by the public sector from newly discovered oil reserves can be reinvested in green policies to encourage the transition and accomplish the objectives by 2040, and which will benefit all Guyanese over the long term. With this in mind, PAGE recognises the crucial role of the media as a key partner in the implementation of the Green State Development Strategy: Vision 2040 faithfully explaining the concepts and communicating good lessons and achievements to stakeholders in Guyana. Public awareness and understanding are essential for achieving buy-in and to appreciate long and short-term benefits. 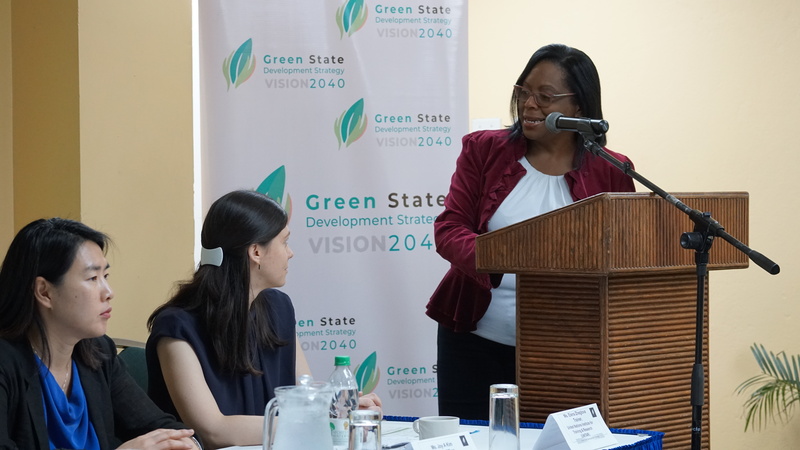 To this end, the media were instructed in effective green economy messaging of relevance to Guyana, as well as on how to identify and access trustworthy sources of information on green economy. The two-day Green Economy Modelling workshop introduced System Dynamics Modelling methods and approaches to participants. The Workshop reviewed the modeling work undertaken in Guyana and provided a summary of the key results, running simulation exercises, whilst also interpreting results and Cost Benefit Analyses (CBA). PAGE contributed to the elaboration of the Green State Development Strategy: Vision 2040 by funding studies in economic modelling including assessments on the feasibility of green economy initiatives; green jobs, and green industry and trade assessments. 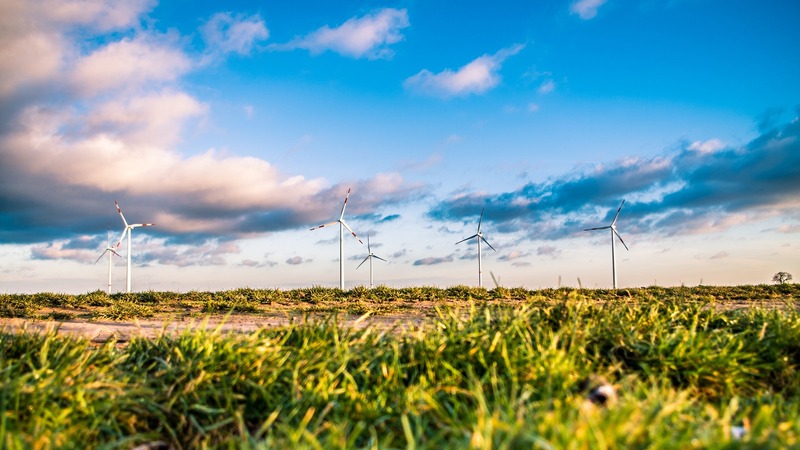 In addition to presenting the findings of the modelling studies in the Strategy, PAGE work has also assessed the economic, social and environmental impacts of selected green policies. Guyana’s Economic Modelling Study (GEMS) used System Dynamics methods that assessed the impacts of a transfer of investments from Business-as-Usual (BAU) to green economy scenarios and how these affect a range of economic, social and environmental indicators. 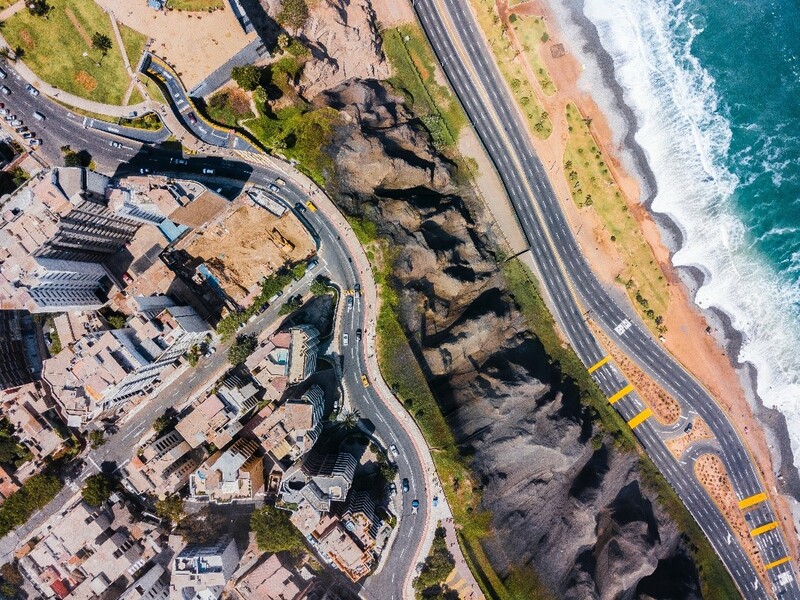 The modelling study evaluated the impact of the selected green policies in four priority sectors - energy, agriculture, forestry and road transport, to 2040. Delivering the Green State Development Strategy: Vision 2040 requires the mobilization of significant investments in infrastructure (transport, ICT, energy), health, education and other priority areas. According to estimates in Guyana’s GEMS, investment needed for green economy interventions in the four key sectors amount to GYD 1.05 trillion between 2018 and 2040, equal to 2.7 per cent of GDP. Green fiscal policies can play an important role in this context. By reflecting externalities in prices, mobilizing revenues, creating a fiscal space for green investment and broader fiscal reform, adopting green fiscal policies can support Guyana in the transition to an inclusive and sustainable long-term growth path. The Green Fiscal Policies workshop explored the role and benefits of green fiscal policies in addressing environmental externalities by including for example, resource use prices, which can promote shifts in producer and consumer behaviors and in mobilizing public and private revenues to support policy implementation. The Workshop consisted of a series of presentations, videos, interactive group exercises and knowledge sharing on green fiscal policies across different sectors. PAGE is discussing with the Government of Guyana how it can continue to provide support for on-going analysis of green fiscal options. The final activity of Green Economy Week was a “Green Conversations” public event with the objective to continue the series of conversations with the public begun in 2018 in the context of the Green State Development Strategy: Vision 2040 and on green economy principles. Speakers featured international green economy experts from UN Environment discussing international cases where green economy principles and carbon taxes were effectively applied. PAGE will continue to support the implementation of the Strategy in Guyana and to help its people to progress along the pathway to a green economy. In more than one way Kazakhstan is at a crossroads. The strategic position of the largest landlocked economy of the world makes it a natural connector between China and Europe, between South Asia and Russia. Politically and economically, Kazakhstan seems to be at a crossroad also, with various directions in sight and some tough decisions to be made. …with social unrest and demands to improve the livelihoods of Kazakh people? …with an industry heavily focussed on oil and extractives, accounting for more than 80 percent of electricity generation and responsible for one of the highest per capita GHG emission rates globally? … with goals to reduce the energy intensity of the national economy by 25 percent through 2020? Adding to the political uncertainty, on 21 of February the President Nazarbayev signed a decree to dismiss his cabinet of ministers. The radical change came 2 days before the first official multi-agency visit of the Partnership for Action on Green Economy (PAGE) to the country. 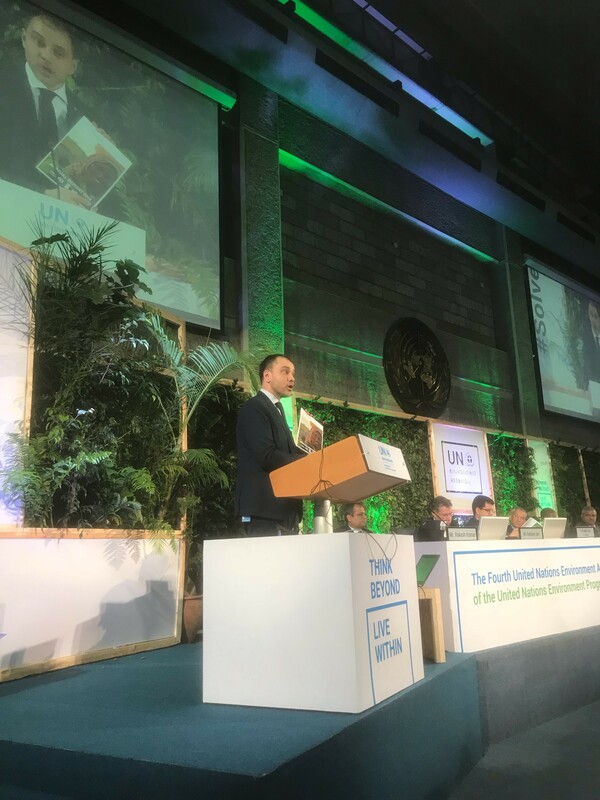 Despite uncertainties, PAGE received a very warm reception and universal support for the transition of the country to an inclusive green economy in all meetings and consultations held. During the period 28 February – 1 March 2019, the PAGE delegation met and had fruitful discussions with officials from the Ministries of Energy, Agriculture, National Economy, Industry and Infrastructural Development. A stakeholder consultation was organized, where more than 30 government and non-government organizations and officials took part. The message the PAGE delegation received from various sides was clear: Kazakhstan is committed to a transition towards a green economy. Such transition is not seen as a contradiction to the social objectives declared by the president, on the contrary. Higher energy efficiency, green business opportunities, clean and efficient agriculture and integrated waste and water management shall contribute to a happier, wealthier, more productive Kazakhstan. The direction is clear, but Kazakhstan still has a long way to go. In 2018 the Republic joined PAGE with the objective of achieving the ambitious targets set out in its National Development Strategy Kazakhstan 2050 and its Green Economy Concept (an IGE roadmap for the country). These targets include sourcing as much as 30% of its energy from renewables by 2030, increasing to 50% by 2050. At the sectoral level, Kazakhstan aspires to become a regional hub for green finance, which would provide further support for investments in green economy. The Government is taking concrete steps to achieve green objectives, including through an overhaul of the Green Economy Concept and by integrating SDG targets and indicators into national planning. PAGE can support these efforts through macroeconomic assessment and evidence-based research. In strategic sectors – such as energy and waste, PAGE can provide policy support and guidance. To ensure the longevity of the green transition, PAGE will work with national learning institutions to ensure that human capital is developed in the country. 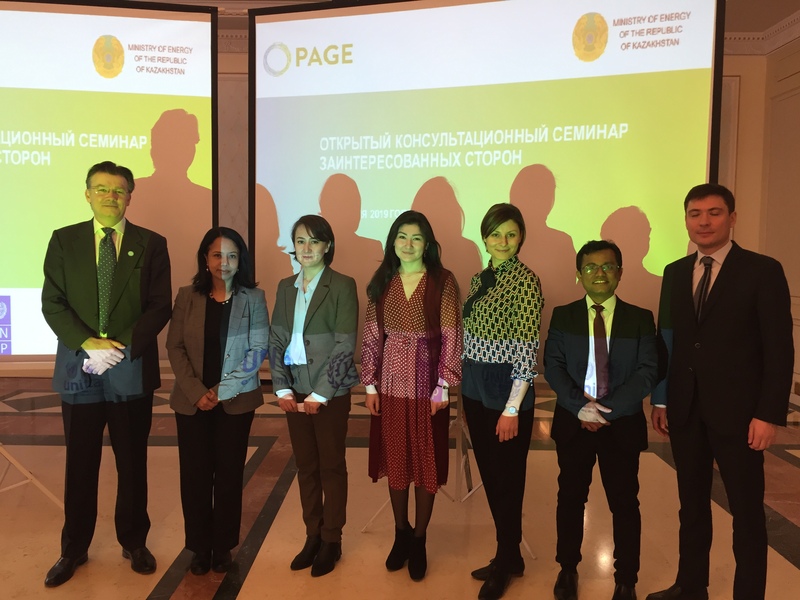 To get off to a good start, in the next 4 to 6 months, PAGE Kazakhstan will focus on stocktaking, partnership building and priority setting in collaboration with Ministry of Energy and other key national stakeholders. Over the next few months the Partnership will formalize its country present by hiring a full time national coordinator based in Astana. Stay tuned for more exciting inclusive green development from Central Asia! “Global Partnerships: Keys to Unlocking Resource Efficiency & Inclusive Green Economies” UNEA4 event, hosted by the Ministry of Environment, Forests and Climate Change of India in association with UN Environment and the Partnership for Action on Green Economy (PAGE), celebrated partnerships as fundamental platforms to break the logic of business as usual and move towards green inclusive economies leaving “no one behind”. The event opened with the official launch of the 2018 PAGE Annual Report, showcasing progress and achievements made by the eighteen countries in their pathways to sustainability under PAGE, as well as the Partnership impact at the global level. India is a new member of PAGE and the biggest member country now. Rahul Chhabra, High Commissioner for India, pointed out that India is leading in many environmental initiatives, particularly in the field of agro-ecology and transforming the practices and lives of over 500 000 farmers. As India has one of the highest resource extraction rates in the world, and with an expected GDP growth rate of 6% in the coming years, he asked the question of how can we make better use of our resources? and that Life cycle approach and circular economy will be key to strengthening resource security. As underlined by Jochen Flasbarth, State Secretary of Environment for Germany, “transforming economies from brown to green globally, requires more than just ‘money’, and it’s about changing the logic around markets in general”. In this process, he added “collaboration is key; without this we will have no chance at achieving the SDGs.” Finally, he referred to PAGE as a potential platform that can effectively help with ‘leapfrogging’ and developing industries around renewable energy. Satya Tripathi, Assistant Secretary General and Director of UN Environment, commending Germany great support through PAGE, called the Partnership as one of the most innovative and promising UN partnerships available to help countries reach the 2030 agenda. High Commissioner Koleka Mqulwana from S. Africa noted that there were over 500 participants from over 50 countries, at the ministerial PAGE conference on 10th -11th Jan 2019 in Cape Town. She stated that a fundamental shift from consumption and growth to circular economy needs financial and economic transitions. “Social inclusion is absolutely paramount, ‘no-one can be left behind’ and that work is fundamental to human dignity, so we need to concentrate on providing and improving livelihoods and work opportunities” she said, “we can and will expand and scale up the PAGE partnership beyond 2020”. The One Planet network has formed to implement the commitment of the 10-Year Framework of Programmes on Sustainable Consumption and Production. It is a multi-stakeholder partnership for sustainable development, generating collective impact through its six programmes: Public procurement, Buildings and construction, Tourism, Food systems, Consumer information, and Lifestyles and education. The strategic objective of the One Planet network for the period 2018-2022 is to be recognized as the lead mechanism to support and implement the shift to sustainable consumption and production patterns, contributing as an effective implementing mechanism of Goal 12—Responsible consumption and production—of the 2030 Agenda for Sustainable Development. The International Resource Panel was launched by UN Environment in 2007 to build and share the knowledge needed to improve our use of resources worldwide. The Life Cycle Initiative is a public-private, multi-stakeholder partnership enabling the global use of credible life cycle knowledge by private and public decision makers to achieve global sustainability goals faster and more efficiently. 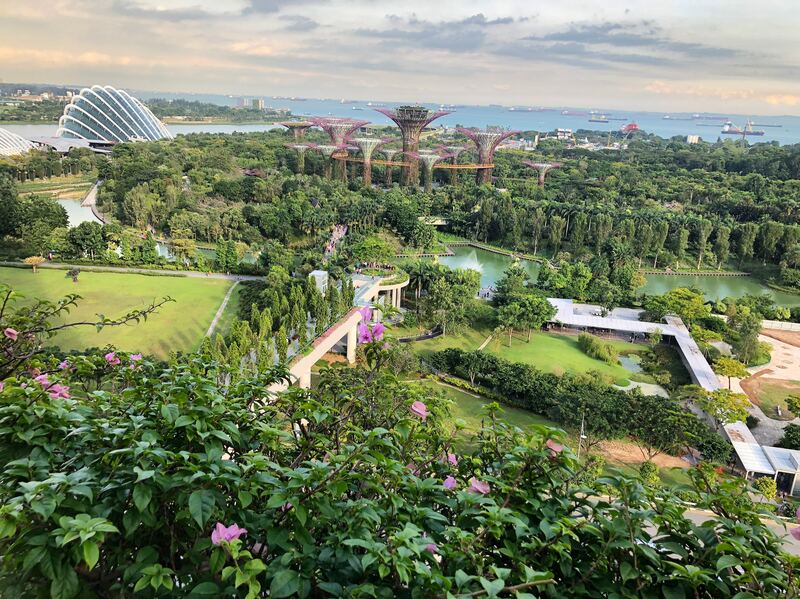 Hosted by UN Environment, the Life Cycle Initiative provides a global forum to ensure science-based support to decisions and policies towards the shared vision of sustainability as a public good. It delivers authoritative opinion on sound tools and approaches by engaging its multi-stakeholder partnership (including governments, businesses, scientific and civil society organizations, and individuals). 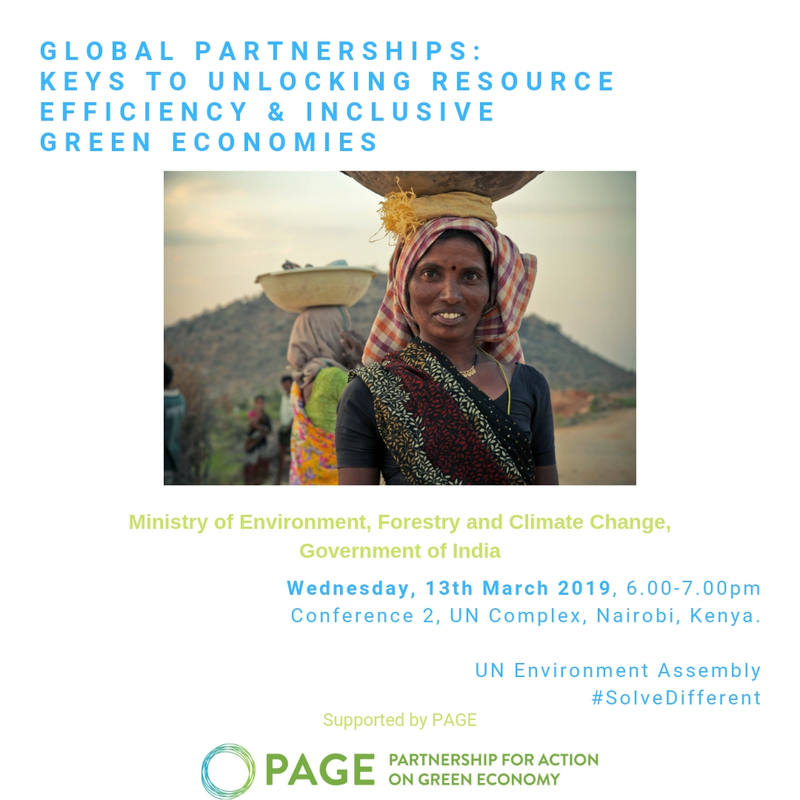 13 March 2019 (6:00-7:00 pm EAT) - PAGE is supporting the Government of India in organizing an event on Global Partnerships: Keys to Unlocking Resource Efficiency & Inclusive Green Economies at UNEA4. The event will discuss the Government of India experience and main green economy initiatives as well as the role of partnerships in unlocking resource efficiency and greener and more inclusive economies. Discuss the Government of India’s initiatives like the Partnership for Action on Green Economy (PAGE), to achieve sustainable consumption and production. Ulysses tied himself to the mast so that he would not hear the sirens; or if he did, he would at least not change course. As I pulled into Delhi earlier this month for the Indo-German dialogue, I wondered if we ourselves have tied ourselves to the mast. The atmosphere in Delhi was shocking - despite all best efforts to come to grips with air pollution, a dull haze blanketed the city, the particulate matter almost palpable with every breath. Well beyond the World Health Organization standards, the quality of the air in winter in Delhi has reached epic proportions, and one that goes well beyond an environmental question. It is affecting everyone. During the dialogue, we touched upon the issues like these that are now becoming commonplace around the globe. The subtle and not so subtle erosion of public goods like clean air and water that we once took for granted - and how to face up to them. One of the more riveting moments happened when someone in the audience asked, where is the drama? Where is the emotional force we need to tackle these issues? My thoughts went immediately to Greta Thunberg, the courageous young teenager from Sweden who has singlehandedly started a movement to contest the status quo and the belief that we can do little. Traveling to the World Economic Forum in Davos last month (by train, over 32 hours!) she delivered a wake-up call, under the heading of «Our House is on Fire ». And indeed, it is. Like the air in Delhi, the statistics are shocking. The last five years are the hottest on record, the warming oceans are creating polar vortexes, and extreme weather events exceeded USD 155 billion last year according to Swiss Re. The data all points in one direction, and it one of continuous erosion and draw down of our common wealth. So what to do? Clearly innovation and human ingenuity is a renewable and renewing resource that needs to be brought into play. And equally, we need to create a safe operating space for business and entrepreneurs and society to flourish and create value, while aiming for a « social floor » that meets the basic needs of all. Fortunately we have a plan that can take us there - the sustainable development goals. Universal in nature, agreed by all governments, and covering a rainbow of basic needs for humans to flourish and thrive in the future, the goals also provide a symbol of our diversity and strength in going forward. First, they come as a package: there is hardly one goal that can be achieved in isolation from the others. Second, they provide a yardstick for measuring progress: the 17 goals and 187 targets and indicators provide a roadmap with milestones, and countries - all countries - can track their progress. And third, they provide a metaphor. This struck me as I gazed on the symbol of the global goals on my colleague’s lapel. A circle, the 17 goals are arrayed to form a colorful entry point to meeting basic human needs in the 21st century. And as a symbol, it is quite powerful, because apart from the evident diversity that mirrors our own diversity of cultures and peoples from around the globe, one can easily visualize the inner circle representing a social floor that Economist Kate Raworth has positioned at the center of our economies, to leave no one behind in terms of access to clear air, water, food, and shelter - the basic elements of human dignity and survival. And the outer ring could easily represent the limits of our safe operating space, the planetary boundaries within which we must operate to create opportunity, income, prosperity and profits. If we exceed the boundaries, we erode the base of our common wealth. Reaching the goals will require courage, creativity, and clarity of purpose. It will require collective and individual efforts to align our actions and our investments. In short, it will require us to rethink our patterns of how we consume and produce, how we save, and spend, and invest. Fortunately, there are at least two or three major windows opening where world leaders of all stripes and sizes can come together to nurture and foster our collective ownership and progress on the goals. The first is the next UN Environment Assembly, coming up in March in Nairobi, Kenya. The theme is on target: innovating to solve environmental challenges, by consuming and producing differently. We are challenged to live within - and think beyond. And to do this, we will need to #SolveDifferent. This is essentially about our lifestyles and how we produce and consume - which sits at the core of the sustainable development goals. The second is the World Circular Economy Forum, where a strong private sector focus guarantees that business leaders who understand the opportunities from enhancing resource efficiency and circularity have a chance to show their wares - and help shape the growing market for greener and more inclusive growth. And third, our very own High Level Political Forum in July 2019, when the focus will be on SDG 8 and 17 among others - inclusive and sustainable growth with decent work; and partnerships to get us out of our silos. We expect heads of state to gather and focus their attention on not only their national agendas and commitments and progress but also the fragile state of our global commons. Because in the end, the goals and the wider UN system itself will only be as strong as the commitment each of us and our nation states devote to it. The sustainable development goals need to be nurtured, stewarded, sustained, and invested in. They need to be embraced and upscaled. They need to be translated and owned by all if they are to serve their purpose. 2030 is not so far off. The future we were warned about, the sirens we heard earlier, have told us about the dangers many decades ago. Time to unbind the ropes and change course. And put out that fire in our common home. This article was originally published on the Green Growth Knowledge Platform (GGKP)'s website. 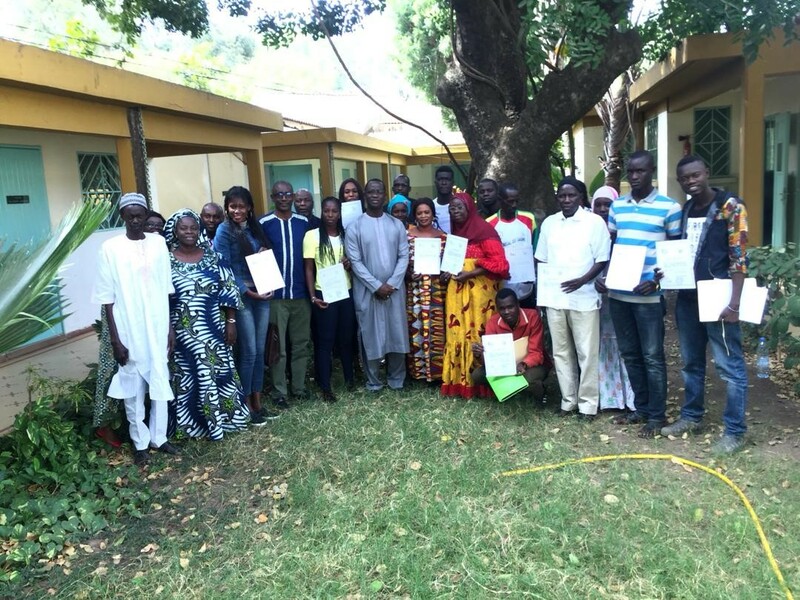 17-22 December 2018, Centre Forest de Thiès, Senegal – A Green Entrepreneurship training workshop brought together 37 entrepreneurs from various sectors, mainly active in the management of plastic waste, the manufacture of solar equipment, energy efficiency in the transport of dairy products in rural areas and the operation of mobile solar kiosks. The workshop also brought to practice 19 “Start and Improve your Business” (SIYB) Programme (GERME) trainers. GERME (Gérez mieux votre entreprise) is a management training programme developed by the International Labour Organization (ILO) with a focus on starting and improving small businesses with the objective to create more sustainable jobs for women and men, especially in emerging economies. It allows entrepreneurs to develop and improve their skills in procurement, stock management, marketing, cost estimation, maintenance of accounting records, planning of activities and human resources management. With a well-estimated awareness program in more than 100 countries, it is one of the largest global programs in this field. Together with the Partnership for Action of Green Economy (PAGE) and the Green Jobs Opportunity Support Program (PACEV), ILO organized a first workshop in November 2017 to further strengthen a pool of trainers from Senegal and Burkina Faso already being trained within the GERME programme. In the GERME process, the implementation of programs first passes through the trainers who later accompany the ultimate beneficiaries. At this second stage of the training, the trainers provided coaching for female and male entrepreneurs, with the support of an SIYB master trainer. The training provided the basis for promoting the integration of the environmental dimension in the supply, production and marketing functions of existing companies' goods and services; orientation towards green business ideas and, where appropriate, the creation of green businesses in Senegal. Important and interesting results were obtained on the knowledge of environmental challenges, consequences and solutions; about the green business as a concept and its benefits, about the characteristics of a green entrepreneur and green business ideas; on the steps of creating a green business; on the greening of production processes and the monitoring and evaluation of the appliance. The Partnership for Action on Green Economy (PAGE), supports the Green Jobs Opportunity Support Program (PACEV). PACEV (Programme d’appui à la Création d’opportunités d’Emplois Verts) is a joint program of the Ministry of Environment and Sustainable Development and UNDP. Its purpose is to ensure the sound management of the environment and resources and to reduce poverty by creating green jobs. ILO’s support consists of improving the skills of eco-entrepreneurs who are beneficiaries of PACEV. The objective is to reinforce their capacities in creation and management of companies oriented towards the protection of the environment. In this support, the ILO is using the GERME Network. The GERME methodology meets the training needs of potential entrepreneurs and those in practice starting from the business idea to the improvement of management skills through the creation of viable businesses. This methodology provides a differentiated response depending on the level of education of the ultimate beneficiaries, the problem of the creation and management of companies. It is applied in more than 120 countries around the world and is placed in most training programs of governments and development organizations. The biggest innovation in the environmental dimension has been the development of the Green Enterprise Brochure (BEV). This brochure takes into account the three dimensions of the methodology (orientation to self-employment, business creation and business management) with a "green view". The Green Business Brochure is part of the GERME product series and the Green Jobs package from the ILO.